My friend Sara writes a blog, Seeking Sanctuary, where she concocts ways to make her and her readers’ lives better. Earlier this year we talked about discovering new and rediscovering old ways to cut costs for our families and help the environment. Pop the pour spout off the old laundry container. Rinse if necessary. 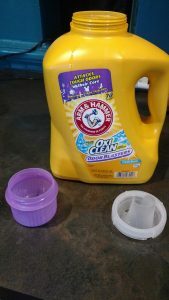 Dump the dish detergent into the container and set aside. 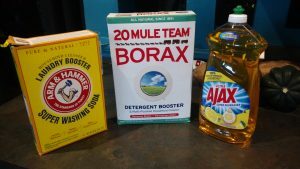 Place the washing soda and Borax into a stainless steel pot, add 4 cups hot water, and stir over medium heat until the powders are thoroughly dissolved – do not boil or simmer, just gentle heat. Then pour that liquid into the container with the dish detergent and stir with a wood or stainless steel spoon. Slowly, to avoid excessive bubbles, add enough water to fill the container, stir and – you’re done! So easy! I don’t add fragrances because I’ve found that they don’t have much staying power unless I use a ton, which defeats the purpose of cheap. Instead, I add fragrance to the drier cycle. To stop static cling, I took aluminum foil and wadded it into 3 balls that I could fit in my hand – these are reusable, so you only need to make them once. Toss the balls into the drier with the clothes. Then, if fragrance is desired, I spray a piece of cut-up old towel with whatever blend of essential oils I happen to favor at the moment and toss it in. Run drier as usual. This eliminates the need for fabric softeners – extra savings and less plastic. You can also use your favorite perfumes, my daughter uses her body spray to scent her clothes and that works just as well. And, of course, you can go scentless. I’ll be posting more discoveries later. Enjoy!